Factory 8 track into aftermarket radio possible? I have the Antique Auto Radio reproduction AM/FM radio installed in my Cutlass and I'm happy with it, running through an amp installed in the trunk and two speakers in the front and in the rear of the car. I have a factory 8 track player I would like to connect to this radio and play through the amp and speakers. I've identified the important wires coming from the 8 track - a yellow power wire, the black grounds and the two speaker wires for the front and back factory speaker set up. What I would like to do is connect these speaker wires and ground to a 3.5 mm connector and connect it using the AUX input in the back of the stereo. Would this/could this work? I don't know whether the output signal from the 8 track would be too much or not enough for the aftermarket radio connection. How would I tell? I'm no electronic whiz by any means - just willing to try stuff. Is there a better way you would connect the 8 track? Should I use a line output converter? Thanks for any thoughts or suggestions! Last edited by BSiegPaint; November 5th, 2018 at 03:02 AM. The factory eight track units are totally self-contained. The eight track was wired "downstream" from the radio speaker outputs. When not using the eight track, the speaker wires simply passed through the eight track unit and played the radio output. When you put a tape into the eight track, the speaker wires are disconnected from the radio and connected to the amp in the eight track unit. You could do the same thing - run the speaker output from the stereo through the eight track - but the aftermarket stereo speakers probably have a different impedance than the factory ones the eight track was designed to use. If you want to run the eight track through the aftermarket stereo using an AUX input, you'll likely need to go into the eight track and pull off the low-level signal before it gets to the amp in the eight track unit. Joe, thank you for the added insight. I have a wiring schematic that should be in the mail today, so I'll be pouring over this all evening. I like the thought of running the power through the 8 track as the factory did it. Lots to think about - I'll be sure and post this up as a "how to" if it works.... 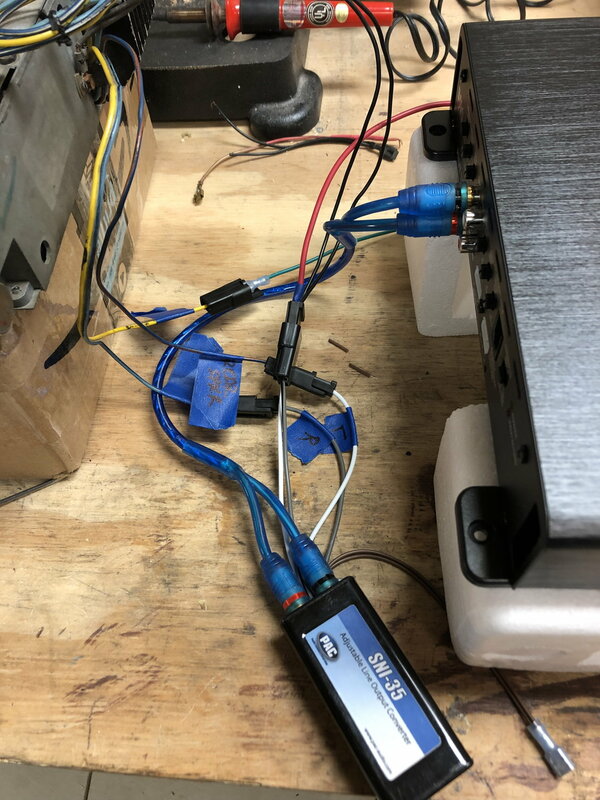 I bet I could divert the front speaker wires from the stereo head unit into the player using a line level converter, then out to the amp from the player. When the 8 track isn't on, speaker signal and 12v power goes right though the player and nothing is changed. When the 8 track is in, power to the head unit is diverted, speaker signal is now from the 8 track unit and is sent to the amp - which sends the signal into the 4 speakers as normal. Am I thinking correctly? Would I need another line level converter from the 8 track unit to the amp? This eliminates any thought of using the AUX input on the head unit and makes it operate as factory. Am I thinking correctly? Would I need another line level converter from the 8 track unit to the amp? This eliminates any thought of using the AUX input on the head unit and makes it operate as factory. The eight track output is high level, so you'd need another line level converter to route that to your external amp. Alternately, you'd need to go into the eight track unit and tap in where the low level signal enters the eight track internal amp to source the signal for your external amp. If you are using an amplifier on the stereo unit you will need to get Male-to-Female RCA cords that can be cut to run them to the inputs and outputs of the 8-track. Your stereo output will be in the 500 mili watt range. Your 8-track will have 5~8 watt output so use a line-level converter at the output of the 8-track to reduce it to the same level as the stereo. 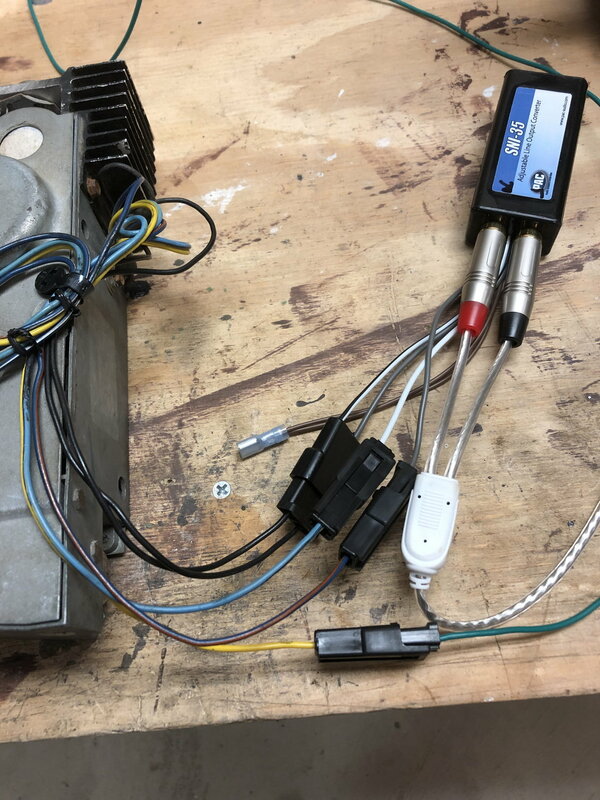 Running the low level signal through the switch in the 8-track may allow noise to enter the system so make sure you keep the shield connection separated from the vehicle ground to reduce the chance of getting massive noise. If you can connect to the low level signal inside the 8-track like Joe says, you can most likely avoid the line-level converter. If all that fails to produce quality sound or generates too much noise, a low-level adapter on the 8-track into the AUX port of the stereo may be the easiest route to connect everything. Last edited by cjsdad; November 30th, 2018 at 09:35 AM. Aftermarket stereo going into protection mode with engine on? Is it possible to install a 69 dash into a 70 cutlass supreme? Quick Reply: Factory 8 track into aftermarket radio possible?